Yale University uses negative-stiffness vibration isolation to stabilize microscopy in sensitive micron-level brain-imaging research. For 42 years, the Yale School of Medicine has been conducting research on neuronal activity in brain cells to develop methods for imaging brain activity. Yet it was not until several years ago that the university opted to move to a higher level of vibration isolation technology to support its microscopy imaging, which is conducted at the micron level. It is not unusual for universities, and industry for that matter, to have problems with site vibration, which compromise to a greater or lesser degree the imaging quality and data sets they acquire through microscopy. Although every lab wants to eliminate unwanted vibration, conventional systems such as air tables have not been successful in providing an adequate level of vibration isolation for ultra-sensitive equipment measuring at the Angstrom and micron levels. Such was the case with the Department of Cellular and Molecular Physiology Lab, where air tables had been the mainstay for the lab's vibration isolation. The tables, however, were not able to provide adequate isolation to conduct neuronal research at the micron level. Many individual neurons or brain areas are active at once, explains Professor Lawrence E. Cohen, head of the department's lab. Yet conventional electrode techniques allow only one or a few neurons or locations to be monitored at once. This is only one example of why studying the brain is difficult. "We have worked on several variations of an optical method for measuring brain activity, utilizing both voltage- and calcium-sensitive dye methods to study neuron activity," says Cohen. "In favorable preparations, the spike activity of about 500 individual neurons or thousands of brain regions can be monitored simultaneously. These methods have good temporal (msec) and spatial (10s of microns) resolution." Monitoring multiple neurons or regions simultaneously can improve researchers' understanding of how nervous systems are organized. Dr. Cohen's lab recently used these methods to study the processing of olfactory information in a turtle and mouse. "We have obtained maps of the input to the olfactory bulb that define the responsiveness of individual olfactory receptor proteins. In the future, we hope to obtain maps of the output of the bulb. A comparison of the two maps can provide a powerful description of the role of the olfactory bulb in processing olfactory signals," states Cohen. "Depending on the dye, we can view the voltage across the neuron membrane or the calcium concentration inside the neuron," Cohen explains. The voltage is the signal the cell uses to carry information from one end to the next, much like how cells in the human spinal cord receive information from and send information to the toes. To view nerve cell activity, the lab uses the NeuroCCD-SMQ 80?80-pixel CCD camera, from Red Shirt Imaging, LLC, which delivers 2000 frames per second with a high quantum efficiency of about 0.9, which converts almost all photons into electrons. In contrast, photographic film has a quantum efficiency of ?0.01, converting less than 1% of photons into darkened silver grains. During optical monitoring of brain activity, each pixel in the recording receives light from a small portion of neurons that have been stained by microin- jection of the dye into the brain. After waiting for the dye to spread into the processes, it can be used to monitor changes in membrane potential in dendrites and axons. When the lab uses a low magnification objective to form an image of a vertebrate brain on the high-speed NeuroCCD-SMQ camera or the NeuroCCD-SM256 featuring 256?256 pixels, each pixel receives light from hundreds or thousands of neurons. These population signals monitor coherent activity-those events that involve simultaneous changes in activity of a substantial fraction of the neurons in the imaged region. "Measuring in the dimension of microns still requires vibration isolation because it is so small," says Cohen, as the slightest movement has a huge effect. "If you are viewing at ten microns and the lab vibrates by ten microns, then you are in big trouble." When the Yale decided to employ a higher level of vibration isolation, they invested in Minus K Technology, Inc., which Dr. David L. Platus founded in 1993. Platus is not only the company's president but also the inventor of the negative-stiffness mechanism technology. According to Cohen, the Minus K BM-10 benchtop vibration isolation platform offers better results than the air tables previously used the lab. The table performed poorly in the X/Y plane, yet the isolator reduces vibration in the X/Y plane just as well as in the Z plane. Measuring only 4.6" X 12.2" X 12.2", the platform offers a 1.5-Hz horizontal and 0.5-Hz vertical natural frequency. Plus, there are only two adjustments. "For years, we have worked hard to get rid of vibration noise, with only partial success," explains Cohen. The lab is located on the first floor, but Cohen knew from experience that they would have been better off in the basement. "I would spend five to 10 percent of my time worrying about vibrations," he says. However, after the lab employed the use of the negative-stiffness system, his team has not had to worry about vibration noise ever since. 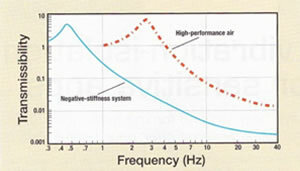 Minus K negative-stiffness isolators employ a completely mechanical concept in low-frequency vibration isolation. They typically use three isolators stacked on top of each other, the top most being a tilt-motion isolator and then a horizontal-motion isolator with a vertical-motion isolator on the bottom.